CAMBRIDGE, UK—BrightSign’s digital sign players have been installed at Bristol Zoo Gardens located in Bristol, UK, to deliver dynamic messages about wildlife, conservation and upcoming events. 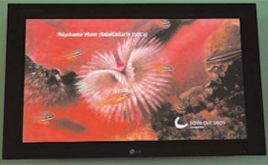 The project’s integrator, Audionation-UK Ltd., recommended BrightSign HD110 controllers to drive the Zoo’s ten digital signs because they deliver high video and image quality, are exceptionally easy to use and affordably priced. As a registered charity, affordability — without sacrificing reliability or quality — was a key issue for the Zoo. With its solid-state platform, the reliability of BrightSign media players is higher than PC-based solutions while pricing is significantly lower. The HD110 also supports full HD at 1080p resolutions for pristine quality and includes BrightAuthor software free of charge. BrightAuthor is a PC application with intuitive templates and tools that make creating, updating, managing, and monitoring digital signage displays easy. Bristol Zoo has already replaced 10 lightboxes with BrightSign-driven digital displays and will soon have 11. It also plans to continue expanding the digital signage program. Currently, the project includes six displays in the Aquarium promoting conservation awareness with video, images, and text on topics such as “Saving Our Seas,” “Meet the Keeper,” and a video alerting visitors to the link between seafood choices and marine conservation. Two displays are also in the Zoo’s Bug World exhibit area and two additional displays are in the Zoo restaurant.